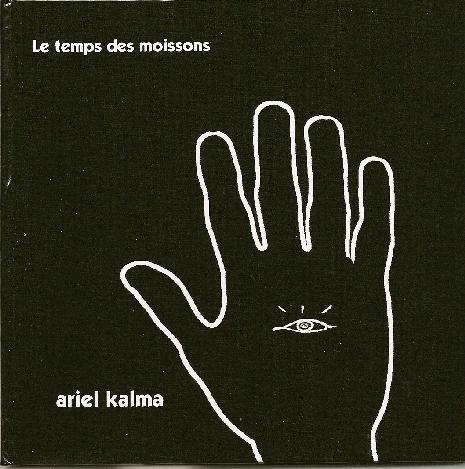 Ariel Kalma - "Le Temps des Moissons"
Prophets, as the old cliché goes, are never accepted in their own country. Such a remark aptly describes the scant but seminal recorded output of France's Ariel Kalma who's labored in comparative obscurity for over thirty years now. But to the initiated he's a genuine, albeit unacknowledged, innovator, a harbinger of a kind of space age tribal sound long before Eno and Byrne had ever dreamed of the exotic possibilities that made My Life in the Bush of Ghosts a trendy avant-garde curio back in 1981. His two 70's albums (1978's Osmose followed Le temps) are stunning evocations of a music that knows no cultural-indeed no terrestrial-boundaries. Like Jon Hassell, whose Vernal Equinox (1977) Le temps resembles in many ways, Kalma transmutes a more or less traditional musical instrument into something rich and strange. His heavily effected sax squeaks, squawks, wails and whines with all the spiritual intensity of a Native American shaman howling at the summer moon from the peak of a ghostly mesa. Perhaps now with this much overdue reissue of his first album, Kalma will start to receive some belated recognition as a progenitor of a form of music that today passes for everything from New Age to ambient to jungle to trance. Kalma himself certainly has his influences. The lengthy title track is unquestionably indebted to Terry Riley's late 60's experiments with tape delay and harmonic repetition. Here Kalma's sax warps back in on itself, creating spectral copies that echo into infinity. The steady drone of Kalma's harmonium provides the perfect static accompaniment for his spiraling sax inventions. The overall effect is akin to some futuristic raga being played out in the steaming marshes of a mythic Venusian rain forest. The more overtly joyous "Bakafrica" still sounds remarkably fresh and vital today but for 1975, it was both revelatory and revolutionary. An intoxicating mixture of African percussion, snaky Afro-beat guitar and Kalma's way out wah-wah sax, "Bakafrica" ushers in tribal fusion five years ahead of schedule. "Reternelle" returns the listener to the incantatory trance involutions of the title track, utilizing much of the same sound architecture (sax, tape delays, harmonium and various electronic filters) to achieve a sublime, flowing arabesque of riotous beauty-the tonal equivalent of being immersed in an ocean of quicksilver. As with Peter Michael Hamel's amazing 70's ensemble Between, the music of Ariel Kalma is both eclectic and cathartic, drawing on the sounds of the whole earth to forge a pan-global musical consciousness that dissolves and ultimately transcends all distinctions of genre.